Clearly, the season is turning. Some days, everything is crisp and warm and breezy. Other days, it's grey and drizzly and cold and webs in the bushes become sinister. For most of the time, they are almost invisible. Come the rain and it turns out the place is covered in them. It's raining. Webs are full of drips. (Not because of the rain. - messy, wet and muddley. It's a mixture and a muddle. Leaves darken and drop, berries brighten. Much dies. Other plants pop back for a final fling. Some flower unseasonably. I'm always excited by these. The seasons sometimes feel relentless. They, and the whole of nature with them, plod along the groove and there's nothing we can do except live through what comes. When a primrose rebels against autumn and waves a flag for spring by flowering in September - I salute it! When it whithers I grieve more for it than for the rest of its family when it drew back earlier in the year. But there are other plants which grab their chance to re-surge and, like bad memories, do their very best to stay through winter. New Buddleia is already on a fight-back, springing out of drains and bursting out of walls. If previous years are anything to go by, ground elder will soon march up to join the newly growing nasties. There's a silly song 'Old judges never die, they don't even fade away.'. I think it's by Instant Sunshine - someone will know (? ? ?). Nettles are old judges in the hedge rows. They grow threadbare and lean a little but stay. New nettles grow up round them. Little barristers. In the photo (above) of the web smothered hedges, you'll see a window in the upper right hand corner. Humans (as well as spiders) live round here. How else would the hedge be there? And where am I? I'm on an old railway line which is now a path for pedestrians and a cycleway. (I've taken against cyclists. Pensioners on racing tanks too. I think The Council should take the names of pedestrians going onto the path and check them off at the other end to make sure they've survived!) Back to the point. That window in the corner decided me to make this a wall post as much as a hedgerow one. An 'oh look humans are here after all' sort of essay instead of pretending we are the only two-footers on Earth as I usually do. So . . . here is a 'not a hedge'. Lichen likes a stone wall and will be here all winter (for ever!?). On the old railway line itself, in front of a platform (in effect, a the foot of a wall) - this. And on the opposite platform . . . what it one day will be? Here is some other new life. Disgusting if you look close. Some caterpillars are nice. These are not. En masse, they are horrid. Their nest is about four inches long and strongly built. If you want to see them, you'd better click the picture. And here's how the seasons are muddled in with each other. The same nest, a few days later. Winter seems closer when it rains! Lucy that last web looks huge - its a wonder it can even hold itself together under the weight of those raindrops on each of its threads. I think those caterpillars look more like elongated maggots rather than caterpillars. Maybe they'll be nicer after they pupate...... look what happened to the Ugly duckling - there's always hope. You've touched on one of life's mysteries - what is the difference between a maggot and a caterpillar? Is it just that we like one and not the other? There - now I've something else to find out! P.S. Another mystery is why caterpillar ends with 'ar' instead of 'er'. I have to correct myself every time I write it. went to ask the OED. It says uncertainly from French for 'hairy cat' and the word pillar. What? Why? I typed the two words into Google and it seems caterpillars grow up to be butterflies and moths, maggots will be flies. I now have lost my appetite with all this talk of maggots. Ugh. I love your web photos. Very nice shots. I love this time of year as well, it is almost a bit of a relief when I can just throw my hands up and ignore the garden. It is over for another year, the snow will be arriving and covering up all my mistakes, and I can dream of spring. Glad you like the webs. Great post Lucy. I love photo-narratives! I'm a bit envious, because we have no real winter or fall here. Most of the trees don't change with the seasons and it doesn't get that cold or rainy. Have you any idea what kind of caterpillars they are? I didn't realise caterpillars were around at this time of year. My first thought would have been spiders which just goes to show how much I know. 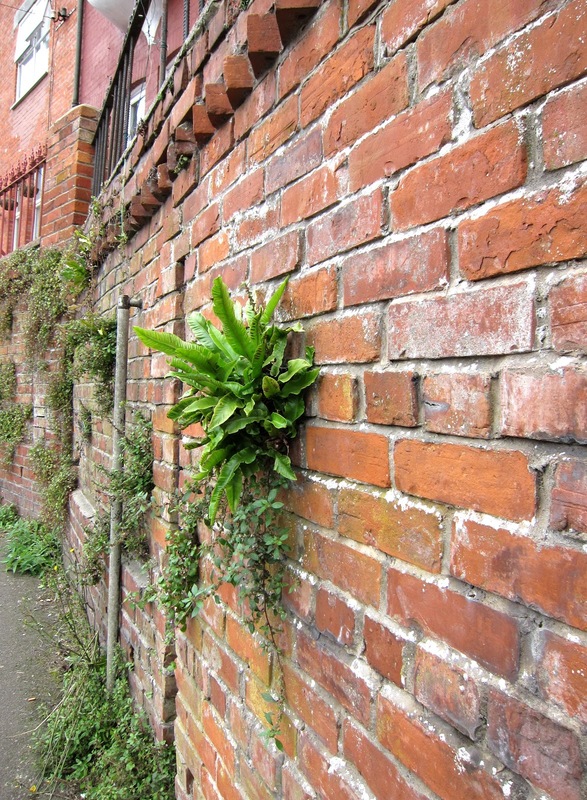 Love the buddlea growing out of the wall. It's just so IMPROBABLE! Sorry for the delay in replying to your comment on Loose and Leafy. I never manage to keep up with things! I think I would feel claustrophobic in a place where seasons hardly change. It's built into us here, from the moment we are born really, to notice whether there's sun or rain or growth or dyeing. Every morning we look out of the window to see what the weather's doing, more or less as the first action of the day. I think the stereotype of the British always moaning is the flip side of us always looking forward to something different - which (I reckon) turns out to be positive attribute after all! We are always looking forward to sun or rain or . . . But, if I had to get stuck with anything . . .oh! . . . I nearly said I'd like to be stuck in Autumn because it's my favourite time of year but on reflection, that wouldn't work either. There's an odd sort of expectancy in the air during Autumn and, if I were breathing it all the time I'd land up exhausted - as if I spent my life on tip-toes. When I read your comment, I put on my shoes, picked up my camera, and set out to see if there was any indication of what the caterpillars (maggots?) had turned into. So much for the spirit of discovery - the local council contractors had been along to cut back the hedges, so the nest had gone! I saw a similar nest last year but never found out what came out of it so this may turn out to be a very long process . . . roll on next October! This kind of Buddleia has a habit of growing out of walls here. It follows railways and the lines railways took before they were dug up so it can be a problem for people maintaining bridges. Where I live, it even grows out of drains in the gutters.